Basic homemade spaghetti without any sauce. 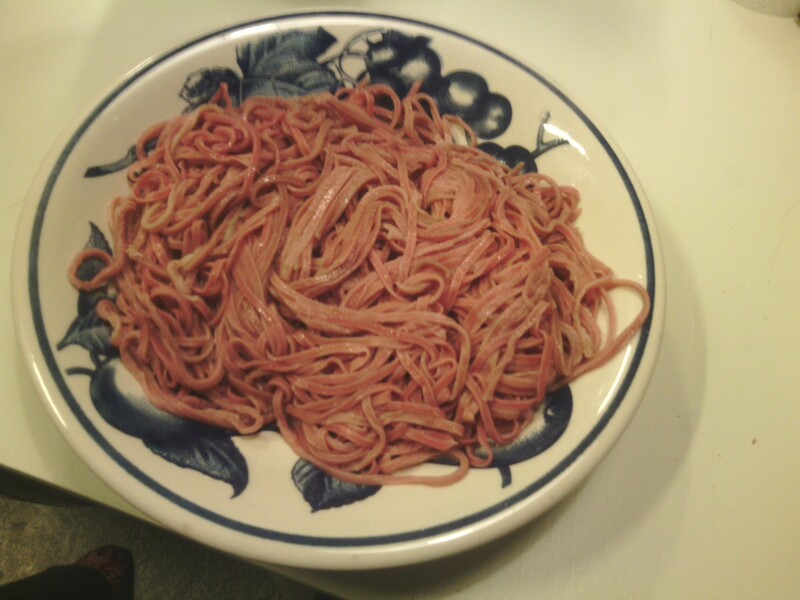 The pasta dough was colored with freshly squeezed beetroot juice. There is one recipe every parent should teach their kids – how to make pasta. Real pasta is inexpensive, nutritious, easy to make and very versatile. It is an ideal dish when you want to impress your date (or significant other). If you have the space, invest in a good quality hand-cranked pasta machine. You can often find them on E-bay or Amazon. I purchased mine second hand for just over €10 (about US$12). The hand-cranked machines tend to be more reliable and durable than the electric pasta machines. In the end, of course it boils down to personal preference. I have a good friend who makes his own sourdough bread and pasta from scratch. Unfortunately, he works a lot and suffers from a brain injury that has destroyed his fine motor skills. He doesn’t let that stop him. Instead he uses a kitchen mixer with a dough hook to kneed his dough and an electric pasta machine to make the pasta. It helps him get around his disability and also saves time. Simply mix the eggs and flour, then knead until the dough no longer sticks to the bench top. It should resemble play-doh in texture. Wrap the dough in a towel or plastic wrap and leave in the refrigerator for a few hours (overnight is ideal). That’s it! If you want to get fancy, you can add some fresh beetroot juice, spinach, herbs, tomato puree or squid ink to the dough ingredients. Experiment! Making tagliatelle pasta in the hand-cranked pasta machine. Take a piece of dough about twice the size of a golfball. Flatten it and dip both sides in flour. Put it through the pasta machine, several times, reducing the thickness each time. Once the strip of dough is nice and thin, pass it through the cutters to get tagliatelle or spaghetti (depending on your machine). Traditionally, pasta has been made by hand using a rolling pin and knife. On a well-floured surface, roll out the pasta dough thinly (2-3mm). Dust the dough with flour and fold over itself. 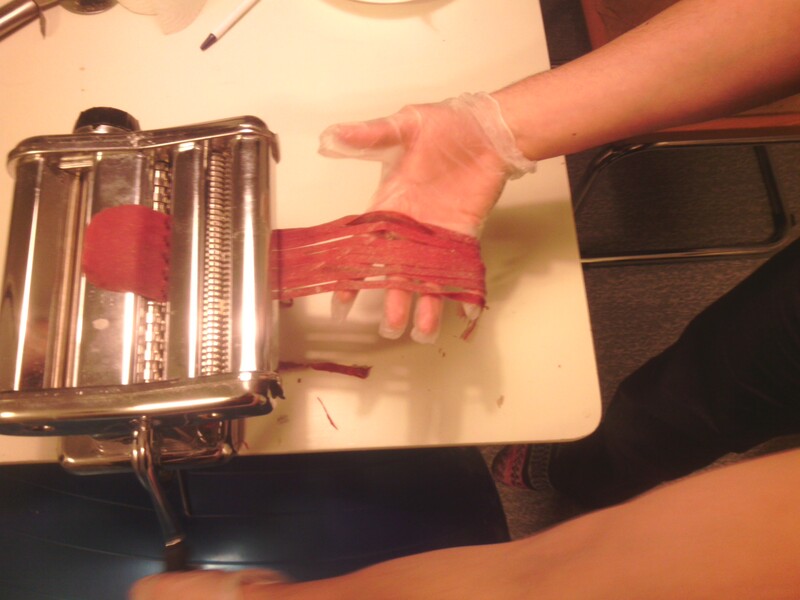 Cut strips with a sharp knife, about 5-10mm apart. You now have your own homemade tagliatelle! 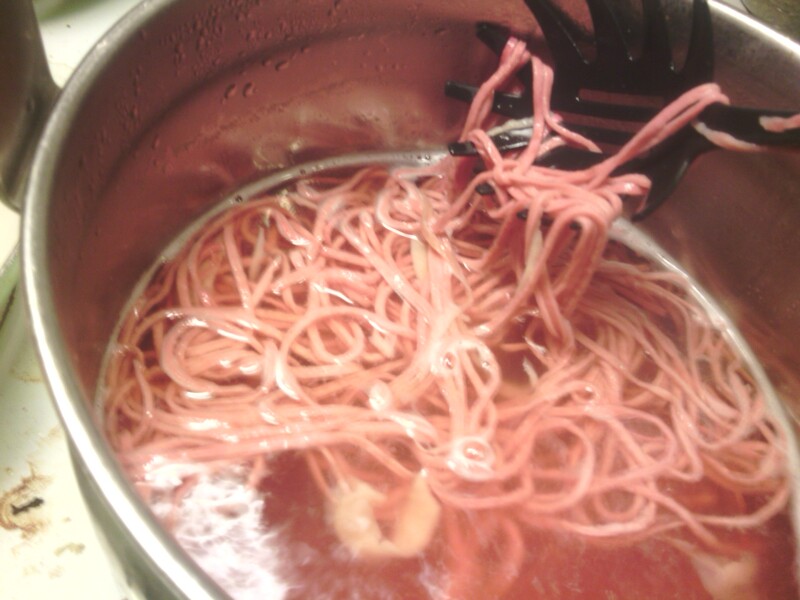 Spaghetti being boiled in salted water. Regardless of how you prepare your pasta, it will be quick to cook. Bring a pot of salted water to a rolling boil and add your pasta. It will swell and become lighter in colour. Depending on how thick it is, this will normally take 1-3 minutes to cook. Once ready, lift the pasta onto a serving plate, add some butter or olive oil and serve with fresh basil. Making a sauce? Then add the cooked pasta to the sauce and allow them to cook together for 30 seconds. Mix thoroughly, lift the pasta onto the plate and serve. Buonissimo!